Thinning and greying hair is often associated with aging and loss of health. Specially formulated to target greying and thinning hair, Topp Care’s very own Signature Absolutte Masque Hair Treatment is its first of its kind of hair treatment that contains a Dual Effect benefits to your hair. People as young as 15 years old, tend to face different hair issues and Topp Care provides a solution for everyone. Using natural Western Botanicals ingredients such as Saw Palmetto, Almond oil and Jojoba oil to create a variety of customised masques to target individual hair concerns. The results? Naturally thicker and darker hair so that everyone, be it young or old, can look and feel great. 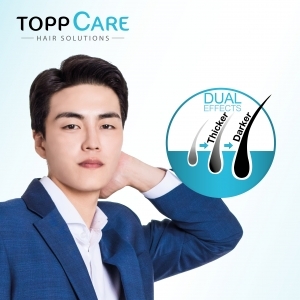 Topp Care’s Absolutte Masque Hair Treatment also incorporates an acupressure-point scalp massage that increases blood flow to your hair follicles for optimum hair growth. Besides helping to alleviate stress, the massage technique prevents further hair loss by dilating the blood capillaries of the scalp, promoting blood circulation and nourishing the scalp skin as well as muscles. It also aids in the removal of dead skin cells from the scalp as a flaky scalp is known to worsen hair loss in certain individuals.